The 21-year-old allegedly "bulldozed" through a restricted area, climbed over a protective fence and jumped into a pool filled with three domesticated crocodiles. The pool - a popular tourist attraction - was next door to a brewery where he had been drinking. A drunk 21-year-old had his arm ripped off after he jumped into a pool full of crocodiles but - incredibly - managed to escape with his life. Despite sustaining several fractures, the man is now reported to be in stable condition. According to The Zimbabwe Chronicle, Collin Miller allegedly "bulldozed" through a restricted area on Thursday night, climbed over a protective fence and jumped into a pool filled with three domesticated crocodiles. The pool - a popular tourist attraction - was next door to a brewery where he had been drinking. "We were shocked when he just stormed into the kitchen despite a sign prohibiting members of the public and exited the window," an eyewitness told the newspaper. "He jumped into the pool and the crocodiles immediately pounced on him. He is lucky because alert guests quickly followed and rescued him but one of the crocs had already cut off his arm," the eyewitness said. 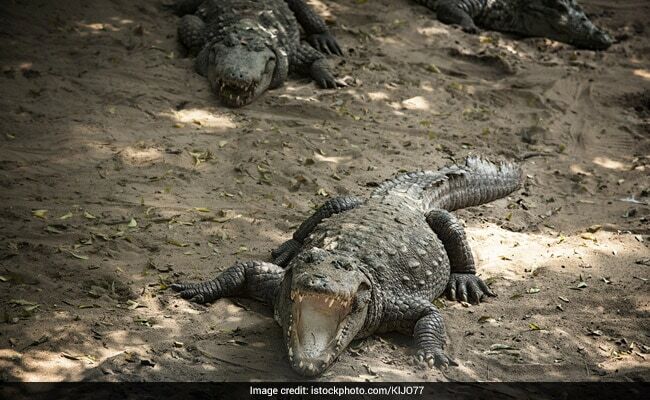 "The other crocodile nearly crushed his head but it turned away to chase after the one with the arm and that's how he was rescued," the eyewitness added. "On Thursday evening a member of the public deliberately climbed over a protective fence and entered the crocodile pool which houses three crocodiles, deliberately putting his life in extreme danger," The Victoria Falls River Brewing Company - the establishment Mr Miller had been drinking at - said in a statement to the press. "He was rescued by incredible efforts of two very brave men including an employee of the Cage Diving Company. He sustained several injuries including loss of arm. The River Brewing Company wishes him a speedy recovery and we are grateful to the quick thinking and bravery of his rescuers," the statement continued. Mr Miller, who is from Zambia, was in Zimbabwe to attend a friend's wedding. "We urge all foreign tourists to avoid taking unnecessary risks when dealing with animals," Zimbabwe Parks and Wildlife Management Authority (Zimparks) told The Daily Mail, calling the incident "unfortunate."